Enjoy Our Fresh Products At Your Upcoming Event! Kettle Corn Makes For Great Party Favors! Enjoy a Variety of Flavors! Try this blend of cherry, green apple, grape and blue raspberry kettle corn all mixed together! As the name states, the main product is kettle corn which is a sweet and salty popcorn. All of our kettle corn flavors are popped on site in a 160qt stainless steel kettle, powered by propane. We use a mushroom style corn that pops larger and fluffier than other types of popcorn. As soon as the corn starts popping, Aunt Susie is stirring it with a wooden paddle and your popcorn treats are almost ready. After popping, they are poured into the sifting bin where the unpopped kernels are separated from the popped kernels and your popcorn is bagged and ready for you to enjoy! Aunt Susie only uses high-quality ingredients, so you can be assured of the best product she can provide. Our popcorn is non-GMO. Need a party favor for your wedding or upcoming event? 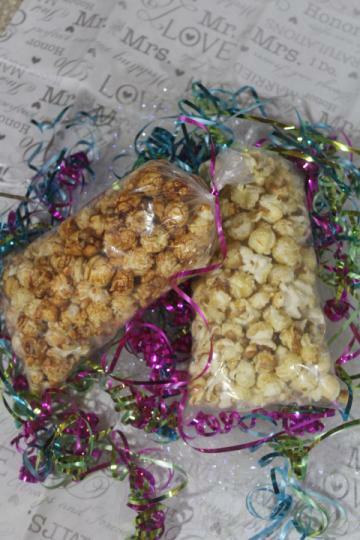 From Christmas stocking stuffers to wedding favors, celebrate with delicious fresh-popped kettle corn! Aunt Susie's can customize the corn to match your colors or theme. We can even cook your kettle corn on-site. You and your guests will love this sweet and salty treat at your event! Want to try something different? 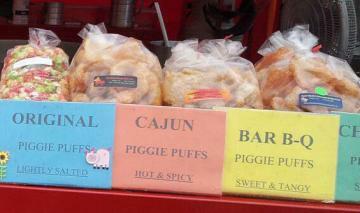 We also offer Piggie Puffs, a lighter version of a pork rind. These puffs are offered with BBQ flavor, Cajun, Chili Lime and Lightly Salted. Sometimes these are so freshly cooked, they are still crackling in the bag. Our Piggie Puffs are all protein. Some of our customers tell us they eat them since they are high in protein! Always served fresh and ever so delicious, you've just got to try one of our Piggie Puffs! *Note: As we are a legitimate company, we hold the trademark for our products' recipes, logo and more.